I've been looking at media coverage of the attack on Oslo and Utoeya, when a bomb in the Norwegian capital and a killing spree on the island left 76 dead. I put the text of the BBC's live updates pages for the 22 and 23 July into Wordle and it created these two images for me. The first is from the 22nd July - the day of the attack. Of course, Wordles look pretty but what do they tell us. Well, a few things struck me. First, it shows how the focus of the BBC's story shifted from Oslo to Utoeya. 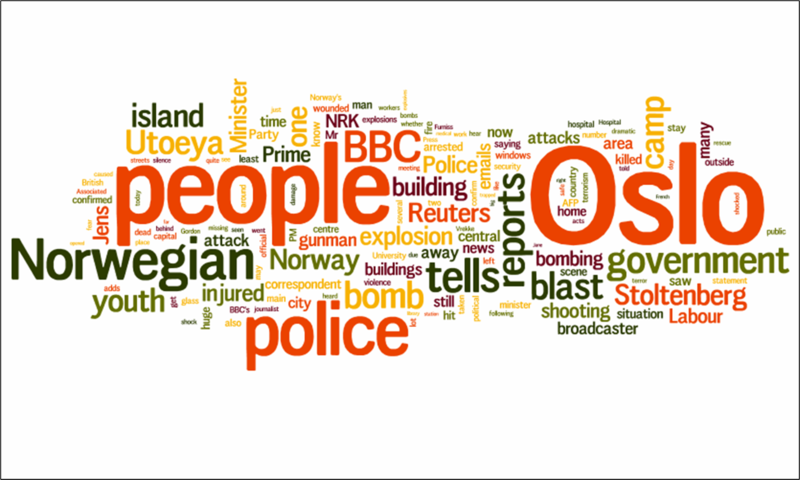 "Oslo" is much more prominent in the Wordle when compared to "Utoeya" on 22 July than on 23 July . The BBC began reporting that an explosion had occurred in Oslo on their live updates page at 15h30 (UK time) and initial news coverage focussed on the blast. The shootings on Utoeya were first reported by the BBC 17h19. As events at Utoeya were unfolding during the evening, there was still plenty of Oslo-based reaction to report and details of what was happening on the island remained sketchy. As the scale of the tragedy at the youth camp emerged overnight, the focus on 23 July shifted towards Utoeya. 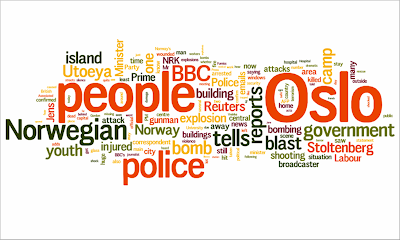 In the Wordle for 23 July, "Oslo" and "Utoeya" have similar weights. 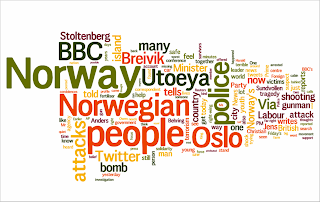 Second, the Wordle shows the emergence of suspect Anders Behring Breivik on 23 July, the man arrested on Utoeya and who later admitted responsibility for the attacks. 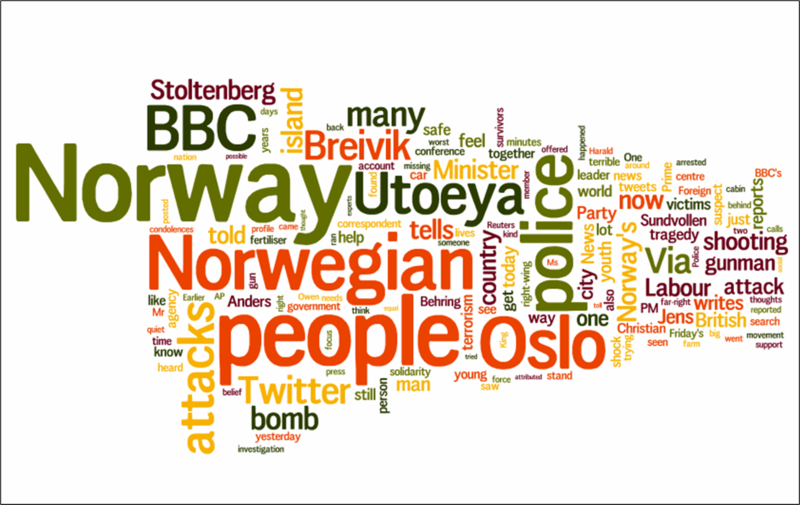 Third, there was much more use of the word "Norway" on 23 July. In part, this may have been due to an increase in the number of general reactions published by the BBC to the attacks in the aftermath when there was less breaking news to report.